My son complains that his wallets can't be sat on too long. I hope that will no longer be the case with this wallet. He was amazed that so much could fit in it. I excavated my old wallet which was almost twice the size of the Allet and everything fit, yet had a much lower profile than my bulky old wallet. Very thin wallet that seems to be really well made. Have been using for a few months and is working great. I finally got tired of having the huge bulky wallet so I decided to go minimalist. I love grommet so it seemed natural to check out what they have. I came across the Allett and I love it. I went with the larger one because of how much stuff I have. I really like that there is a large dual pocket next to the cash one for organization. I keep cash and my fishing license in the larger one and receipts on the shallow one in the back. It looks good and keeps all of my cards and cash organized and in a neat design that is not at all cumbersome. Allett, you may have a lifer on your hands. OK ... so I thought I'd try it and expected that it wouldn't be quite as wonderful as advertised. Well, I was wrong. Its thin - holds all the cards that were in my old wallet and I have to keep checking to see if its there! You've solved a decades old problem - thank you! My wife gave this wallet last year and I love it. After 8 months I still have nothing I'd like to see changed. The feature I like the most about it the most is not the ginormous number of cards you can carry. i like the security of the cards. By facing inward toward the fold the cards are much more secure and there no top or bottom. Whether you carry a few credit cards along with your driver's license, medical insurance card, prescription card, ATM card, ACLU membership card,, etc, you're in good shape. I like the functionality and the construction. First rate all the way around. My husband constantly complained about sitting on a fat wallet. He could not believe that he got everything into this wallet, and now forgets he even has it in his pocket! I hope it holds up because the leather is quite fine. The best wallet I have owned. What I like most is how the layout for credit cards and I use one second for business cards. 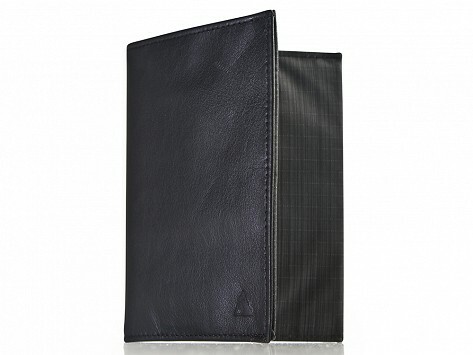 The internal bill compartment has two sections and both allow your bills to store deeply within the wallet. A great product and it's made in the USA! I got this for my husband for Christmas, and he loves this product!